Portabello Candy Cart for Hire | Feel The Magic Ltd.
our Portobello candy cart is fully equipped for 100 to 200 guests. We have a wide selection of 30+ sweets and our standard hire includes a selection of up to 16 different sweet choices. Optionally we can offer Ferrero Rocher or Lindt chocolates – just ask and we will provide a tailored quotation especially for your event. The hire cost includes all paper bags, bag holder, serving tongs and a personalised and framed candy cart sign. The top of our cart is fully customisable, as we can just change the roof to suit your colour scheme. the picture was from a wedding where they requested a black and white stripe to blend in with their scheme. this is something we can do for you, you just need to ask. 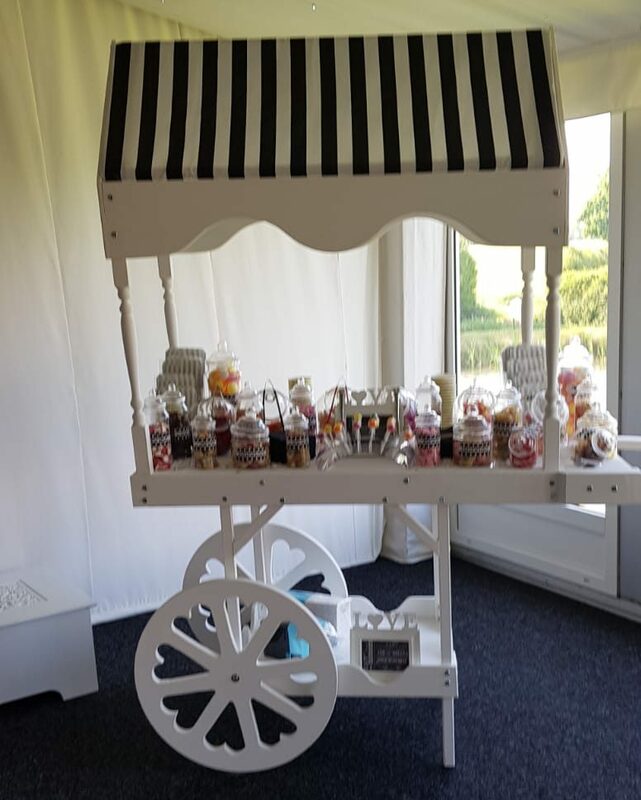 We will deliver and set up within a 10-mile radius of our address (B38 postcode) free of charge and the standard hire packages are based on 100grams of assorted sweets per guest. Any sweets remaining at the end of your event are bagged and left with you. There will be a charge of £1 per mile above the said 10 mile, up to a maximum of 50 miles. Pricing includes setup, decoration and dismantling of the candy cart. Pricing shown below is for a 1-day hire and we do request a refundable security deposit of £100, due one month before your date – this will be invoiced to you and the security deposit is refunded within 3 working days after the event. Please note that this product may contains nuts.